•Length: 30 Ft. (9M) Set •Gauge: 19 gauge / 1.05mm •Color: Black. New release from Ashaway for 2011!. 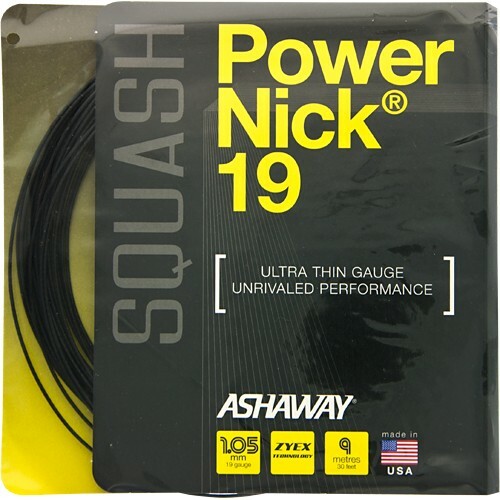 Ashaway PowerNick 19 is the thinnest squash string ever! The new 1.05 mm string utilizes a monofilament core, based on a special formulation developed for Ashaway by Zyex Limited. Designed to provide improved power and performance for both amateur and professional players, PowerNick 19 provides excellent resilience and response, along with a dramatic increase in the ability to grip, cut, slice, and work the ball. PowerNick 19's Zyex monofilament construction prevents tension loss while the ultra-thin 1.05 mm gauge maximizes ball control. The specially designed outer spiral braid provides good gripping action-enhancing spins and slices-while a proprietary outer coating improves stringing and enhances durability.